Allen High School has its own theatre program, The International Thespian Guild, with an official troupe number, even an honor code. But what many students in Allen don’t seem to know about are community theatres like Allen’s Community Theatre (ACT). There are at least two students who look beyond AHS student productions to participating in those community shows: Senior Cassandra Montgomery and Junior Marie Peteuil. In her 8th grade year, Peteuil found Allen’s Community Theatre through Allen High School alumni, Alison Baron, Peteuil said. Theatre opportunities in Allen are relatively limited past the school productions age, with the only all age-inclusive company being ACT. However community theatres aren’t the only opportunity students have to further their skills on stage. Troupe 3105 thespians take their job seriously. Many look to community stages as well as regularly performing in Allen High School’s shows. Montgomery has done every show at ACT, beginning with their showing of “Philadelphia Story” in 2016 during the theater’s fifth season in production. Montgomery said that doing outside theatre helps her learn and grow, as well as expanding her knowledge of the art. Allen High’s Thespian Guild won’t let members just do community theatre to satisfy community service requirements. Recent changes to the Guild’s handbook encourage participating in internal theatre opportunities, and internal thespian points earned by contributing to the art by performing or assisting tech crews. These activities are now required to maintain one’s thespianship, similar to the required hours in groups like the National Honor Society. However, Montgomery said she believes being a member of the school’s theatre program has many perks. The Guild is very encouraging of learning new skills to benefit the program. Students say they have found keeping up with inside and outside theatre commitments to be difficult, especially with the rigorous schedules many students at Allen have. However, students like Peteuil said they are managing to find the time for both stages. Peteuil believes balancing the two theatres can be difficult. “You have to make a lot of decisions based on what you would rather do and think of what’s best for you” Peteuil said. Despite working against the odds, students like Peteuil and Montgomery, who want to pursue both in- and out-of-school theatre, stick it out because of their passion for the theatre arts. “[The changes are] not going to discourage me because I love being out there, and I’m going to continue to be out there,” Montgomery said. 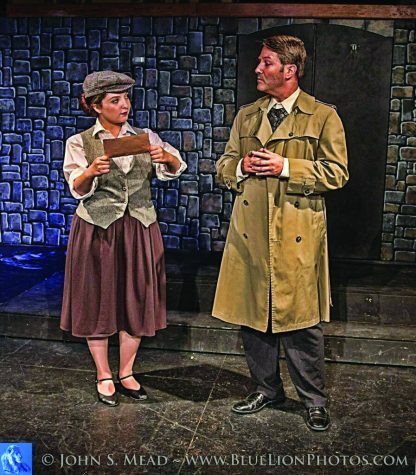 Both Peteuil and Montgomery are currently in ACT’s musical “Young Frankenstein,” which premieres on October 13 through October 29. “If anyone wants to try and do outside theatre, it’sa good way to gauge where your home is and where you want to be,” Peteuil said.